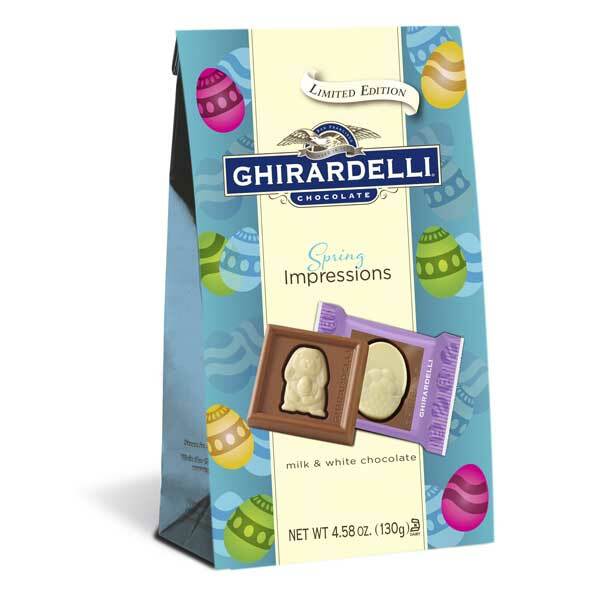 If you haven’t seen them on the Easter candy aisle, Ghirardelli Impressions are individually wrapped chocolates with a white or dark seasonal cameo in the center. This season’s have bunnies, baskets and eggs. They are adorable, so you probably wouldn’t want to melt them into brownie batter. However, they make a great decoration for the tops of brownies. 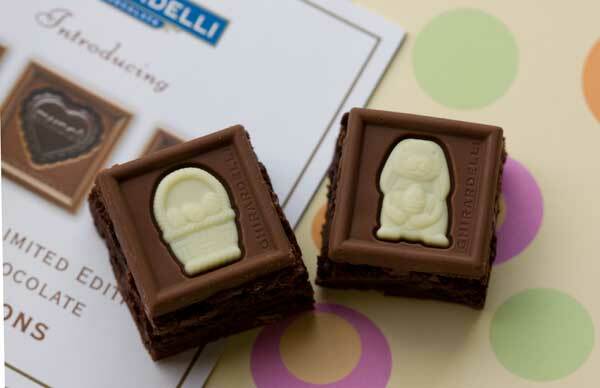 Here’s how you can use Ghirardelli Impressions on brownies. 1. Bake up a batch of your favorite brownies in a foil or parchment lined pan. I made this batch with fudge brownie mix. 2. Let the brownies cool until they are just slightly warm. Place the Impressions about 1/2 inch apart on the brownies. The warmth of the brownies should melt the chocolate just enough so that the bottoms stick. 3. Let the brownies cool completely, then chill thoroughly. Lift from the pan and cut around the Impressions, making sure to sample the brownie trimmings to make sure they’re up to par. That, or save them to make brownie chunk ice cream. And that’s all you do! These were so cute. I made this batch for the family, but I’m thinking of making some for the kids down the street. Any excuse to make brownies, right? Also, the Impressions are limited and seasonal. Hopefully Ghirardelli will have them again around Christmas. I can only hope for Halloween. Cheryl, I just used an 8 inch pan and got about 9. I left more space than needed, so it’s possible you could get 12. You’d probably get at least 18 out of a 9×13 inch pan, but I haven’t tested that yet. Another thing I thought about doing was trimming them a 1/2 inch “frame” of brownie around the Impression, then maybe piping green icing around the edges to look like grass. Might be a little overkill, though. Very cute and easy. So did you make a 9×13 or 8 inch pan? How many did you get? Want to know for Easter dinner–a perfect dessert!